The next iPhone may have a wireless charging system, if a recently published patent by Apple is any indication. And while there are other phones with wireless charging capabilities, like the Nokia Lumia 920, what Apple's aiming for is a little different. The patent covers "various embodiments of a wirelessly powered local computer environment." It uses a near field magnetic resonance (NFMR) to wirelessly charge devices up to 1 meter away. That's right - no contact required. The patent was filed November 2010, but was published just a few days ago. Apple's proposed system is a departure from current wireless charging apparatuses. Those require some sort of contact on a pad or plate to power devices. There are a few examples of wireless charging already on the market, but the tech has yet to gain major traction. As mentioned, the Lumia 920 has a wireless charging accessory, which needs contact to charge. But the plate is a bit pricy at $99 (UK£45, AUD$95). Being able to charge devices from a meter away is a notable advancement and may help proliferate the technology. At the very least it means devices won't have to crowd around and touch a physical object to charge. The patent should give hope to those who were disappointed by the iPhone 5. Wireless charging was on the wish list of many Apple fans during the media hype lead-up of the latest iPhone. But those hopes were dashed when Apple unveiled the Lightning connector and Apple's Senior Vice President of Worldwide Marketing, Phil Schiller, said there would be no wireless charging in the handset. "Having to create another device you have to plug into the wall is actually, for most situations, more complicated," Schiller told AllThingsD the day the iPhone 5 came out. 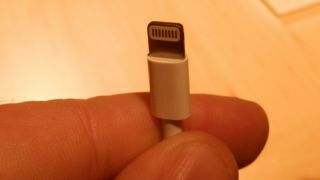 Schiller was defending Apple choice to switch to the Lightning connector and said USB ports were much more ubiquitous, making the new connector more versatile. But this patent might mark a change of position. If Apple goes forward with wireless charging will Schiller have to eat his words? Perhaps not, as Schillers' statement may not be blasting wireless charging but rather speaks to Apple's commitment to simplicity. To that effect, the patent is meant to tackle the "unwieldy" configuration of the many wired chargers and power sources needed for multiple wireless devices. If Apple can cut through that clutter it would make charging iPhones, iPads and iPods together a lot simpler. But Apple's charging system can also reach beyond portable devices. The system could keep a wireless keyboard and mouse powered without the need to change out AA batteries. And Apple loves its wireless keyboards and mice. Though the patent was published a few days ago, some already hear the drum beat of patent war approaching. Tech startup WiPower already patented the whole concept of wireless charging in 2008. Since then, it's been acquired by chip-maker Qualcomm. Then the company joined The Alliance For Wireless Power, which is working on a similar no-touch charging system. Apple's well-known court rival, Samsung, is also in the alliance. WiPower's original patent and other Samsung intellectual properties form the backbone of the alliance's standard. All this means we might yet see another round of patent infringement lawsuits between Apple and Samsung, though for now we'll just dream of a world without wires.